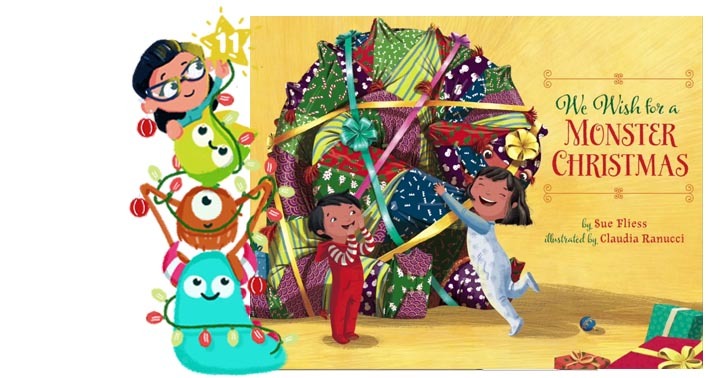 What would a Book Monster Advent be without a Christmas book or two in it. I’ve not come across much this year that has rung my bells in terms of Christmas books I have to say. Maybe I’ve not been looking in the right places or at the right books. But, I got sent this as a little Christmas gift and I do SO love it!! This is We Wish for a Monster Christmas written by Sue Fliess, illustrated by Claudia Ranucci and published by Sterling Children’s Books. This is a simple story about a brother and sister who wish for a monster for Christmas. Mum and Dad say no, but Santa, of course, brings the children exactly what they want, resulting in some rather brilliant moments. This story is very clever, as the intention is that you read it to the tune of ‘We Wish you a Merry Christmas’ and it really does work! It flows very well. However, if, like me, you’re tone deaf, or aren’t quite confident enough to flex your vocal chords at a storytime, then it reads perfectly well as a standard rhyming story too! Lovely stuff. I absolutely adored the illustration in this book. The front cover is genius! We all have that one present which is a horrible shape and awkward to wrap. Well try wrapping a 6 foot monster!! There are lots of funny little details and touches, the characterisation is brililant, it’s bright and colourful. Christmassy but not over the top, and just bags of fun! I really do think this is up there with one of my favourite Christmas books. a feast for the eyes and a delight to read!